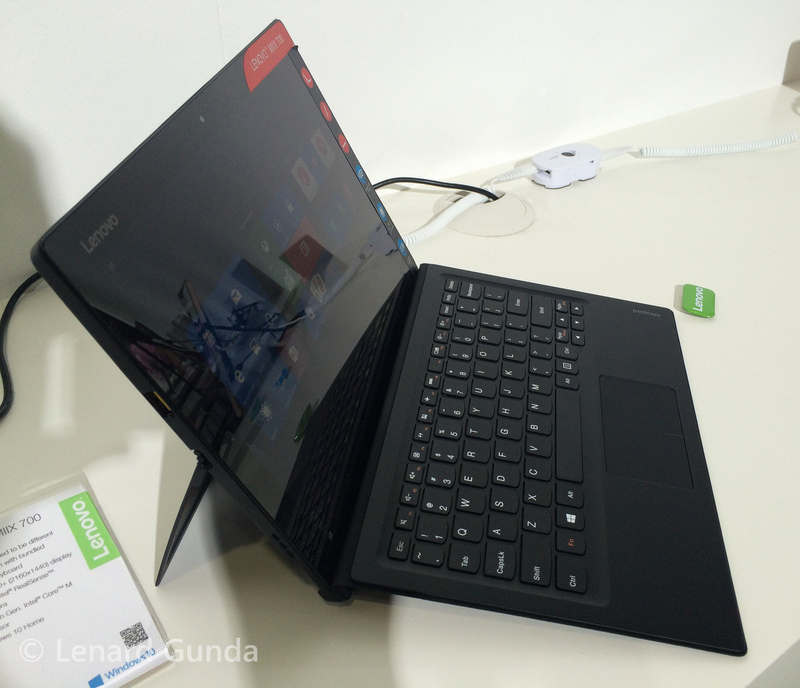 Last week I took part in the Lenovo Launch event in Berlin and also visited the Lenovo booth at IFA. I quickly found myself fond of the Ideapad Miix 700, a new 2-in-1 from Lenovo with a kickstand, a keyboard cover and the latest Core m CPUs inside. This post is a preview of the device, which will be available starting November. You can also check out my images of the Miix 700 on Flickr. 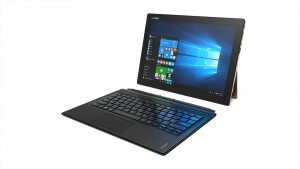 As soon as it was announced, the Miix 700 was called a copy of the Microsoft Surface 3 and Surface Pro 3. The design might be familiar from Microsoft’s Surface family, but it still stands out in my opinion. 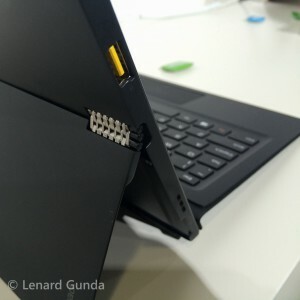 For one, it has those amazing hinges that were introduced last year on the Yoga 3 Pro, and I just cannot stop looking at these hinges. They look awesome. And it does not stop with the looks, because all the review units I tried had very stiff hinges, although I am fairly certain they had to endure quite a lot of opening/closing as people have been testing them. The entire design felt pretty solid yet very light (780 g). 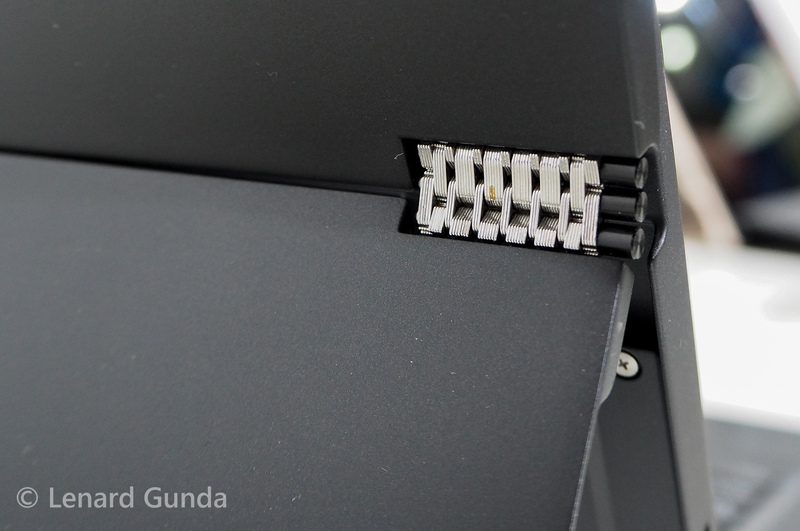 Because it uses the Core m series of CPUs, there are no fans inside (unlike the Surface Pro 3). The 12 inch screen has an FHD+ resolution, which means 2160 x 1440. Lenovo quotes 300 nits for the brightness. The screen looked really nice, but was very glossy (as usual for touch devices). The screen has multitouch. The hinge opens gradually, so there are no predetermined positions. I made a short Vine about the hinge. The device will be available in gold and dark gray, although at this point the spec sheet does not say anything about color options. 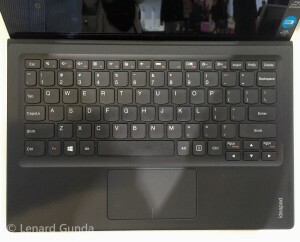 The device has the new and updated Lenovo logo. The Miix 700 comes with Core m processors. This year Intel decided to release a whole family of Core m CPUs, m3, m5 and m7. They should bring an improvement to last year’s Core M.
I did not get a chance to do any performance testing on the Miix 700, but it felt snappy and fast. I have experience with the Yoga 3 Pro, which came equipped with last year’s Core M, and I found its performance to be quite good. So improving on that is definitely going to be usable. Because Core m CPUs can have their TDP set by the device manufacturer, the final performance of the Miix 700 can only be tested once the device becomes available. This means that devices that have Core m inside might not be directly comparable only by using the CPU number, because different manufacturers might implement things a little differently. Hopefully Lenovo will not be limiting the performance because of the form factor of the Miix 700. The Miix 700 also comes equipped with up to 8 GB of RAM, up to 256 GB of SSD storage. Lenovo quotes 9 hours of local video playback. That sounds great, but of course real life performance might vary. You can choose either Windows 10 Pro or Home on the Miix 700. The basic model comes with a 5 MP front and rear camera. Not much else is known about the cameras. But the Miix 700 can also get the Intel RealSense 3D Camera, which makes things interesting. It includes a depth camera in addition to the regular camera (making it more like something you would see on the Kinect). It can be used for advanced facial recognition (Windows Hello), 3D scanning of objects (sounds very cool! ), taking pictures and manipulating/changing the background, etc. I did not have a chance to try these out, and can only wonder if they will have a real use when the Miix 700 hits stores. At least on paper they sound very interesting. The usual Wifi and Bluetooth connections are present. In addition the Miix 700 can come with an LTE / 3G modem (with Micro Sim). There is a USB 3 port (right side), an USB 2 port (left side) and also Micro HDMI out. The USB 2 port is the one that is also used for charging. The bottom side contains the port for the type cover. I had a chance to try the type cover and I typed out some programs on it (being a programmer I always try out keyboards by trying to write code). The keyboard feels really great for something as thin as this. I have tried the Surface type covers, and I do feel that the Miix type cover is better, there is certainly a better feel for the keys. I cannot measure the key travel but it feels deeper on the Miix type cover. The Miix version is not better by a wide margin, but if you type a lot, you will probably notice. The backside of the cover has a leather-like texture on it (I am not sure about the material). 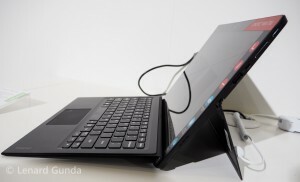 The type cover can be used flat on the desk or it can be magnetically attached to the bottom side of the screen, when it sits up at an angle – just like with the latest version for the Surface Pro 3. But I found that typing while it is at an angle is not as great. It certainly feels better because of the angle, but it also feels worse because there is nothing under the keyboard and writing becomes a little flimsy this way. When the cover sits on the table, the angle is perhaps not as great, but the typing experience feels much better. 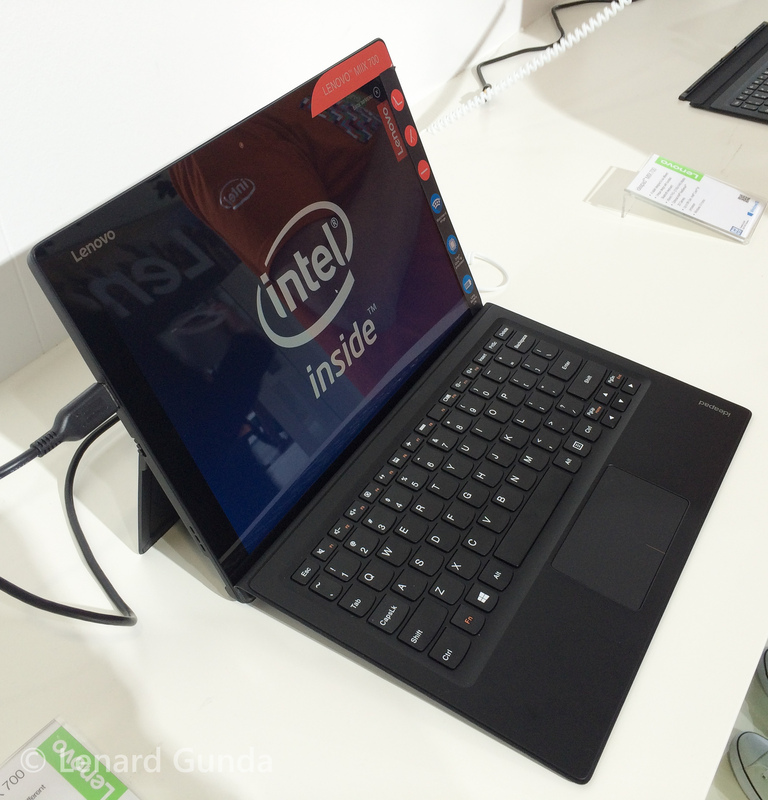 Unfortunately I did not get a chance to try the Miix 700 on my lap, and how it would work without a desk. The type cover uses Bluetooth to connect to the tablet, and has its own battery that is charged from the tablet. We were not given any specs on the battery life or any additional details about how this works, but it allows the tablet and keyboard to be used even when they are not connected together. There will be a pen included, but not much is known about it. The pen in the picture below is a pre-production model and did not work. Because of the similarity on the outside to the Microsoft Surface family, many people will be comparing these devices. Here is my take on this. Size and display. The Surface 3 has a Full HD display at 10 inches, the Surface Pro 3 and the Miix 700 have a 2160×1440 display at 12 inches. In this regard the Miix is just like the Surface Pro 3. Weight. Surface 3 620g, Miix 700 780g, Surface Pro 3 800g. Quite close to the Surface Pro 3. Sales package. 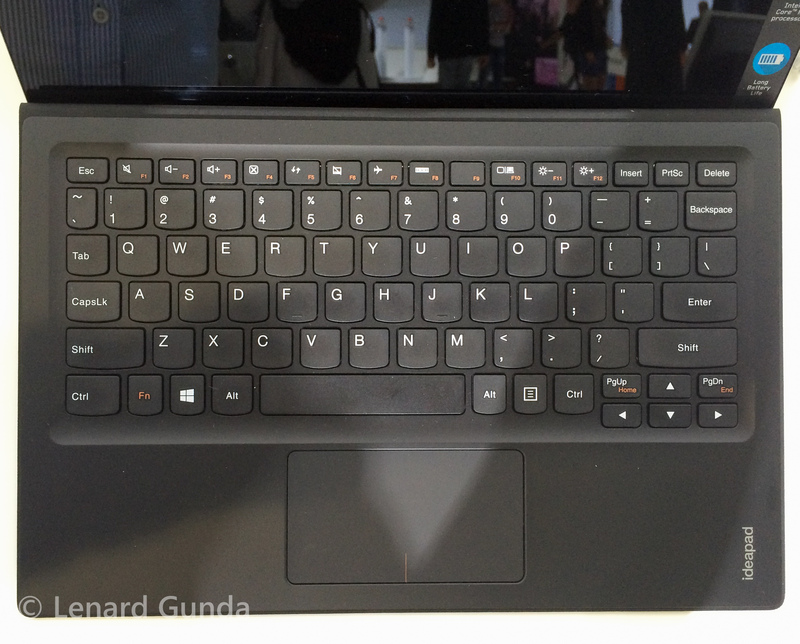 You can’t beat the Miix 700 here, as the typing cover is included in the package. For the Surfaces: a separate purchase is required. CPU. The Surface 3 has an Atom CPU, the Miix 700 the Core m and the Surface Pro 3 the Core i series CPUs. In performance regards the Miix 700 should be somewhere in between the two Surfaces. Memory. The Miix 700 spec sheet says up to 8 GB (I would assume it is either 4 or 8 GB). The Surface 3 comes with 2 or 4 GB, the Surface Pro 3 with 4 or 8 GB. Cameras. The Miix 700 has a 5 MP front and 5 MP back camera, and can also come with the Intel RealSense 3D camera. Surface 3 has 3.5/8 MP cameras, while the Surface Pro 3 has 5/5 MP. Storage. Miix 700 can have up to 256 GB SSD (I would again assume it is either 128 or 256 GB). Surface 3 64 or 128GB, Surface 3 Pro 64, 128, 256 and 512 GB. Connectivity. The Miix 700 and the Surface 3 can be equipped with LTE modem, but the Surface Pro 3 cannot. Kickstand. Surface 3 adjustable in steps, Surface 3 Pro and Miix adjustable gradually. Overall. The Miix 700 is definitely on the upper end of the spectrum, although in some specs the Surface Pro 3 goes over (in highest storage option, better CPUs). Then again, you can get the Miix 700 with the LTE modem, but the Surface Pro 3 cannot get that. I think the Miix 700 sits nicely between the two Surface models (but closer to the higher end Surface Pro 3). And I say this because I have tried Atom powered Windows tablets, and they perform horribly, and I also tried the Yoga 3 Pro which has a Core m, and it is way more usable. Microsoft is expected to update the Surface line in October, it will be interesting to see what happens then and how the Miix 700 compares to the updated Surfaces. I found the Ideapad Miix 700 to be a very intriguing little device. 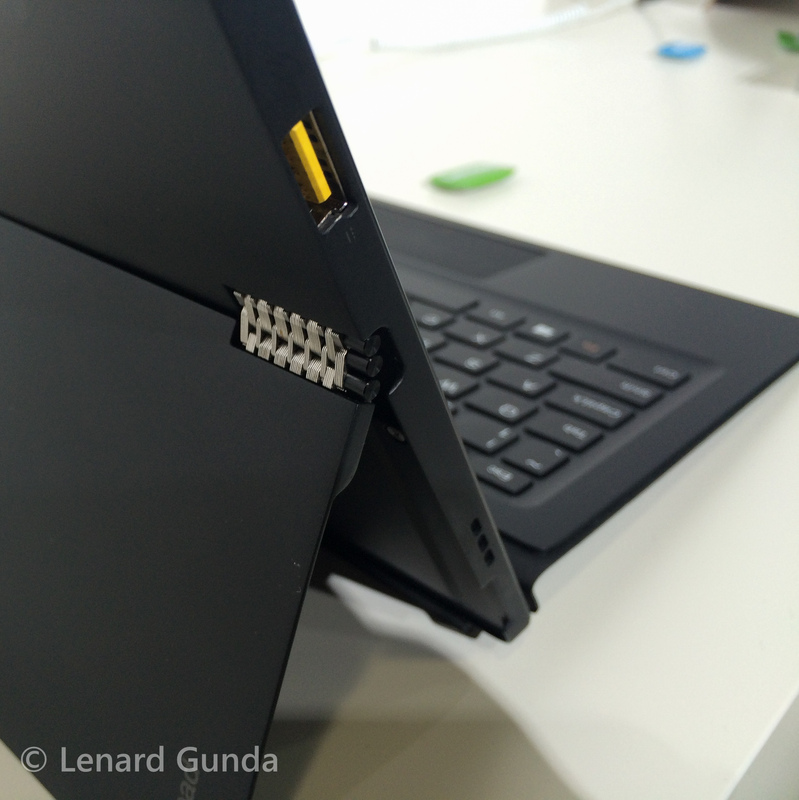 I love the hinge and the specs look good as well. 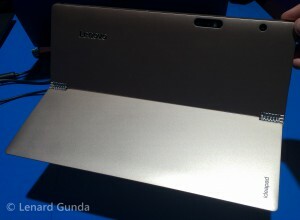 I am a little put down by the Core m CPUs, but then again, Lenovo wanted a tablet that does not have a fan. Putting a Core i CPU in there would have resulted in a larger and bulkier device. Thanks to Core m the battery life looks to be excellent as well. I would say the Miix 700 is a great tablet for those who in addition to consumption want to also do work on their machines. 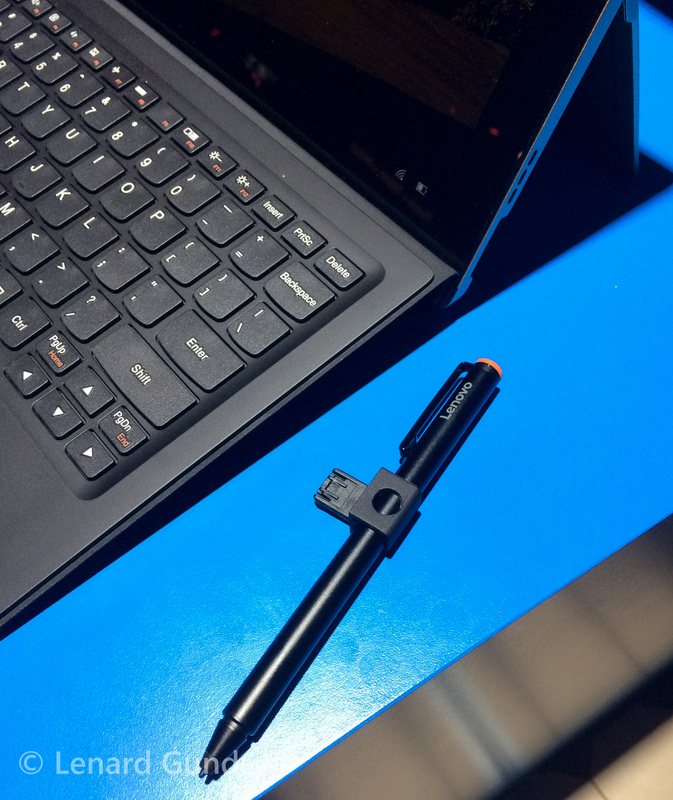 The pen and the included type cover also suggest that Lenovo wants to position the Miix 700 more as a productivity 2-in-1. The Core m CPU should get you buy all everyday tasks really great, but might not be well suited for heavy usage (video editing, AAA gaming). The Miix 700 could make the perfect travel companion. As the Miix 700 is in the Ideapad line, it is more geared towards consumers than professionals. 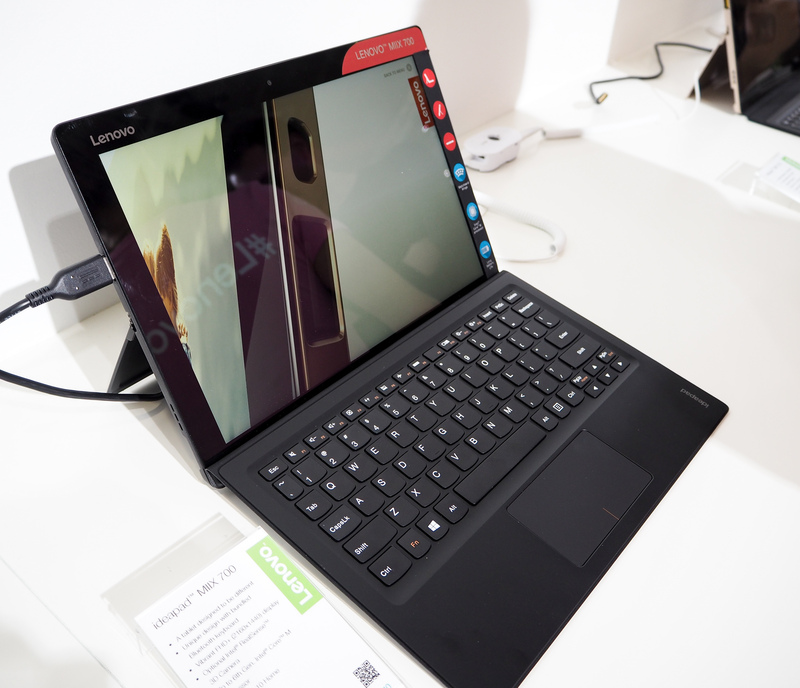 But given how great the Miix 700 looks, I hope CES in January will bring something equally great to business users as well (ThinkPad Helix 3 perhaps? 🙂 ). And in fact there is nothing stopping you from using this in the your business as well, you can also get the Miix 700 with 3 years of warranty, for example.